It's amazing how being short of time can concentrate the mind. I looked at this first thing and wondered if I even liked the HST-ish blocks I was adding around the edges. But I knew that I might not get another good run at it this week and decided to keep going. Now I'm pleased I did: I like how they look and the top is done for now and heading for my quilting pile. Normally I'd take a wee break from piecing now and just quilt for a week or so, but since the next project is already underway I am thinking I'll just move seamlessly (!) on. YES! What a beautiful frame. It looks all in all very harmonic. The darker parts underline the soft colors. All of your quilts look so inviting when you finish them up - irregardless of the color palette you have used. Part of that must be the softness of the recycled fabrics. This quilt has the softness of some violets my grandmother painted on the border of one of her dresses. Of. Ourse, I love it. The straight bits help create a dimensional effect and your border frames this gentle look perfectly. Good job, Kaja. I agree with Kathleen that the recycled material contributes to the softness. Lovely lovely LOVELY!! Another wonderful original quilt top -- kudos to you!!! The gold HST make a great frame and accent. I didn't think I would like it but I do, very much. Like it. Glad you stuck it through. The quilt top is wonderful! I like the slightly darker border and the way it contrasts ever so slightly against the center of the quilt top. It is a real beauty! I am not usually a fan of boarders but that little border you added in between the HSTs and the hourglasses is really great. the hourglasses look like smashed glass, or smashed hourglasses with the sand pouring out and it melding together. I love the work Kaja, so good! 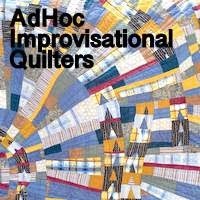 Another unique quilt, so creative! I really love your pretty colour combo, recycling at its best! Sometimes you just have to keep going to see the whole picture. It looks wonderful!! The border enhances the cross-hatch pattern that I have been seeing all along in your quilt. Congratulations! That was a good adventure, a little suspense, and a few surprise turns. Smashing quilt Kaja!! I love the darker HST border. The border gives the whole quilt significantly more depth -- it is interesting how that happened! And the colours are all lovely. Great finish! I like it! It's subtle, but has lots of different places to study and delight! Love the frame--and that you had what you needed to finish it. It's just the right amount darker to complement the interior of the quilt and draw my eye to the darker bits in it.